Pete Carroll dubbed them "Competition Tuesdays" and it went to the heart of everything he accomplished in nine seasons as coach at the University of Southern California. Every Tuesday of the Trojans season was an opportunity, a one-day training camp for backups to prove they should be starters, for starters to reaffirm their dominance and for everyone to know that in Carroll's program there were no favorite sons. It allowed the stars to remain sharp. It reminded coaches to judge what they saw, not what a recruiting ranking or projected depth chart projection said. And it served as a powerful clarion call for the next round of standout recruits. At USC, no matter how stacked the roster, playing time was there for the taking. Always. Just be the best, that's all. That was college and this is the NFL, Carroll is entering his third season with the Seattle Seahawks. You can't go all-out like that each week in the pros. USC's practices were often tougher – actually far tougher – than many games. 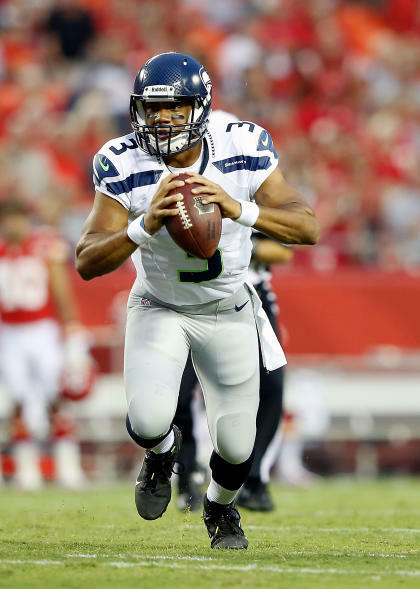 The mindset is the same, though, and it's as clear as Carroll opening himself up to second-guessing by naming third-round draft pick Russell Wilson as the Seahawks starting quarterback. Wilson won the job over high-priced free-agent signee Matt Flynn, who Carroll and general manager John Schneider boldly picked up in March. It also led to the trading of Tavaris Jackson, last year's big free agent and most experienced signal caller in the offense. Jackson was shipped to Buffalo for what will be, at best, a conditional late-round pick. "He's earned the job," Carroll said matter-of-factly of Wilson during a Sunday evening conference call with reporters. "It was a legitimate competition as we said from the beginning, and with the opportunity he's taken advantage of, he deserves to start." You can't argue with the mindset, although too often not everyone really gets a fair shake in an NFL training camp. Too often politics and perception matter, at least with losing clubs. Wilson, out of Wisconsin, has been terrific. He's completed 35 of 52 passes (67.3 percent) for 464 yards, five TDs and one interception in three preseason games. He's also run for 150 yards on 10 scrambles. Not bad for a guy who just over a year ago was a failing minor league baseball prospect in search of a second chance at football. He found it in Madison, Wis., where he excelled in leading the Badgers back to the Rose Bowl. Perhaps more telling, however, was his presence in the locker room. The North Carolina State transfer was named a captain within weeks of arriving on campus. Wilson's complete package began winning over Carroll and Schneider before the draft. They took Wilson 75th overall, even though he measured just 5-foot-10 and didn't posses all sorts of the prototypical features of a NFL QB. They then grew even more impressed in minicamps and over the summer. If Carroll, now 60, vowed to duplicate what he did right at USC in his return trip to the NFL, then there was no way he could sit Wilson in the opener against Arizona. "This is an extraordinary kid," Carroll said. "He just kept knocking us out with what he brought." This is what Seattle hoped Carroll would bring to the franchise, a willingness to make bold moves yet a self-confidence to make even bolder ones – even if it means reversing field. It doesn't make Carroll look like some genius. He's the same guy who handed Flynn a three-year, $26 million contract, $10 million of which is guaranteed. With those kinds of dollars, you're the presumed starter, even if Carroll, at the time, only stated he was "really excited to bring Matt in here to compete with Tarvaris." The Flynn signing was based on almost no body of work. The LSU product started just two games in four years in Green Bay, completing a measly 82 passes as Aaron Rodgers' anonymous backup. A year ago he went 33 of 49 for 519 yards, six TDs and two picks, yet almost all of that (31 of 44, 480 yards and all the TDs) came in the season finale against Detroit. 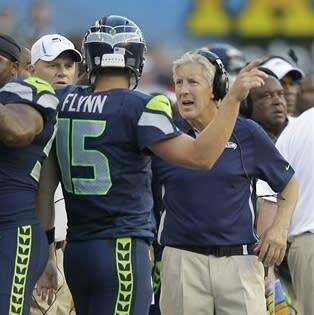 On essentially that single game against a horrific Lions secondary, the Seahawks handed Flynn millions. It was a questionable move, and perhaps a coach less confident than Carroll would have done the easy and face-saving thing and kept Flynn the starter. Flynn hasn't been bad in the preseason, although he's battling an injury. He just hasn't been Russell Wilson. "The more competitive situation we put him in, the better he was," Carroll said of Wilson. "He just has a real knack of playing the game of football." So Flynn's big contract meant nothing to Carroll. The headlines for sticking his neck out and signing him on spec meant even less. The expected grumbling about the wisdom of the original decision wasn't considered. Carroll is coming off consecutive 7-9 seasons, though. It's not like he's earned Bill Belichick job security here. None of it mattered. This was about trust in the power of honest competition. Russell Wilson won the job and said a lot for himself in the process. So, too, did Pete Carroll.